Microsoft launched both of its next-generation Surface 2 tablets Monday, promising significant improvements in performance, graphics and battery life on both the Surface 2 and the Surface Pro 2. 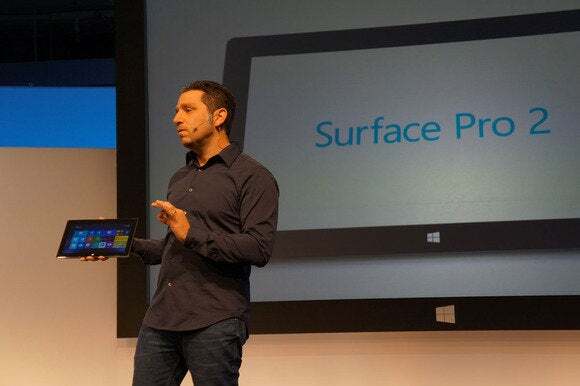 As expected, Microsoft also announced seven peripherals, including a Power Cover and a new docking station, which gives the Surface the power of something close to a workstation PC, according to Panos Panay, the Microsoft vice president in charge of the company’s tablet efforts. The new Surface Pro 2 will come with an Intel Haswell processor and will be able to process 6K raw video data. Surface will cost $449, and will be available in 32GB and 64GB configurations. Surface Pro 2 will come in 64GB and 128GB configurations with 4GB of RAM as well as 256GB and 512GB configurations with 8GB of RAM, with prices starting at $899. A new Touch Cover—Touch Cover 2—will cost $120, and a new Type Cover will sell for $130. Microsoft will take preorders on Tuesday, for delivery on Oct. 22. Microsoft was rightfully proud of the original Surface tablet when it first debuted in June 2012. Although reporters were only granted a few seconds—if that—with the tablet Monday, the obvious quality of the Surface’s VaporMg casing coupled with the intrigue of Windows running on the ARM processor platform instantly made the Surface a desirable piece of hardware. 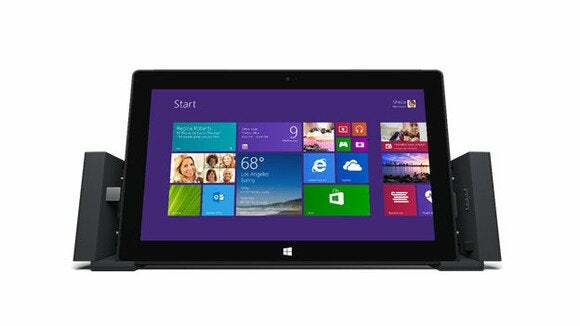 The new Surface Pro 2 with docking station and Touch Cover. A round of grumbling about the Surface soon, er, surfaced, however, when users began playing with the Windows RT operating system and started searching vainly for apps to use with it. Fans of the Surface RT aside, most were awaiting the release of the Surface Pro. When the tablet was released in January 2013, PCWorld dubbed the Surface Pro“the Surface the world had been waiting for.” And it was—just not the whole world. In reality, just a very small part of it. And then the warning bells started to ring: Microsoft wrote down the value of the Surface inventory by $900 million, part of a $150 discount applied to the Surface RT and $100 taken off the price of the Surface Pro that were made permanent. The Surface RT will remain, with a $349 price tag for 32GB and $449 for 64GB, while the Pro costs $799 for 64GB and $899 for 128GB. In the weeks leading up to Monday’s launch, PCWorld—among others—opined about what Microsoft would need to accomplish with the Surface 2. Reports also mostly pegged what Microsoft had planned—a refresh of the tablet using an Intel “Haswell” microprocessor, more RAM, and some new, intriguing covers. The first-generation Surface was the fastest product that users ever tried, Panay said, and the fastest in its class. Surface Pro 2 is faster than 95 percent of all laptops on the market today, Microsoft contends. Graphics now run 50 percent faster than the prior generation; the performance improved by 20 percent to “lightning-fast speeds,” Panay said. Dolby-qualified speakers were also added to improve the sound quality. Panay unveiled an improved kickstand, with “better angles.” It's a dual-mode kickstand that will allow users to angle it back farther. “Sometimes subtlety is the most powerful force,” he said. “This is something that will change the product in ways you cannot expect,” Panay said, referring to the device’s new “lap-ability”. Microsoft also addressed the tablet's battery life. With the new Surface Power Cover, which has a 30 watt-hour battery embedded inside, the Surface Pro 2 will have 2.5 times the battery life of the first Surface Pro—more than 10 hours in total. “Pound for pound, watt for watt, it is the fastest product you can use today,” Panay said. Power Cover will have an estimated retail price of $200 and has a projected release date of early 2014. 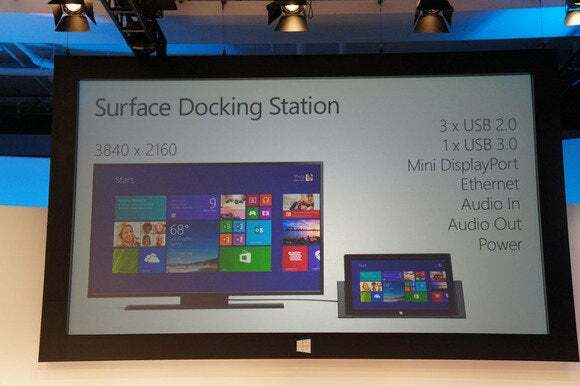 The Surface Docking Station unveiled at a press event Monday adds I/O functionality to Microsoft’s Surface tablet. As expected, Microsoft also launched a docking station, the Surface Docking Station, with adds I/O functionality to the Surface tablet. The docking station can power two separate monitors for a total display resolution of 3840 x 2160, and it includes three USB 2.0 ports, a USB 3.0 port, a MiniDisplayPort connector that will power two displays, ethernet, and Audio In, Audio Out, plus power. “We now have a workstation PC built in” to the Surface tablet, Panay said. The Docking Station for Surface Pro will have an estimated retail price of $200 and has a projected release date of early 2014. Microsoft showed off video being produced by the RED camera, manipulating raw 6K footage. Moviemakers can take the tablet to the set itself, Panay said. Microsoft also launched Type Cover 2, available in four colors—cyan (blue), magenta (pink), purple, and black. “It’s clear that input makes you productive,” Panay said. The latest Type Cover is one millimeter thinner the overall model, but with a better key switch that makes Type Cover 2 almost as thin as the original Touch Cover. And it’s silent, he said. Even better, it features a backlit keyboard that automatically dims after about six seconds—then relights when the user uses it again. The second generation of Type Covers ditches the all-black stylings of their predecessors with new cyan, magenta, and purple color options. Panay also launched Touch Cover 2, a 2.5 mm-thick cover that is a millimeter thinner than previous generations, and is also backlit. The number of sensors inside the Touch Cover has been beefed up from 80 sensors to 1092, to improve the feel of the device. “What does that mean? It means you can’t miss a key,” Panay said. Users can even do gestures on top of the new Touch Cover. Finally, there’s the Surface Remix Project, a cover specifically designed for DJs. The cover is also pressure-sensitive and lets you use your tablet like a drum kit. But what about the Windows RT-powered Surface 2? Microsoft also redesigned it. “It’s not the changes that everyone wanted, but it has the change that people need,” Panay said. “It’s the fastest product that I’ve used relative to a personal tablet,” Panay said. The CPU speed has increased “dramatically,” and Microsoft doubled the speed of the Wi-Fi as well as the speed of the memory. Microsoft even added a Surface logo to the back of it. The Surface Pro 2 and the Surface 2 share the same screen. Battery life has increased to 12 hours, 25 percent better than the original Surface, Panay said. But Microsoft also made the Surface 2 lighter and thinner. An HDMI output allows users to throw games on the large display. “I’ll tell you how it’s even sexier, because it is,” he said. You’’ll find more apps in the Windows Store for the Surface tablets this time around, Microsoft says—more than 100,000 in fact. Part of the sexiness, Panay said, derives from Windows 8.1, the new version of the Windows OS. Panay said that the number of apps have increased in the Windows Store, to more than 100,000. And the most powerful app is Microsoft Office: Word, Excel, OneNote, PowerPoint, and Outlook. Users will receive free international calling with Skype and access to Skype hotspots free for a year. Additionally, Microsoft put a third sensor in the front of the tablet to improve the look of Skype callers. The sensor will filter additional light through the product to “light” the maker of the Skype call. Panay also highlighted the power of Microsoft’s services, including SkyDrive, which Microsoft will beef up: Surface buyers will receive a free, additional 200GB of SkyDrive for two years.